Don’t Miss the Chance, Moonshine Beach is Only Open Until September! If you’re looking for a great place for an exciting activity on the beach followed by a cool splash to cool you off, visit Moonshine Beach in Branson this first month of autumn season. This sandy Moonshine Beach is open only until September, so don’t miss the chance to experience a wonderful getaway for a family picnic, swimming, or camping. Beautifully located on the north end of Table Rock Lake near Table Rock Dam, make sure to spend some awesome time here as you will be seeing spectacular views of the beautiful lakeside scenery. Beginning May 15 until September 15, Moonshine Beach opens at 9 am and closes at 9 pm. After a day of fun of sightseeing and shopping around Branson, take advantage of this great recreation place that has to offer. Moonshine Beach is a “day use” facility only with no overnight camping. It is operated by Ozarks Rivers Heritage Foundation, a nonprofit corporation, under contract with the U.S. Army Corps of Engineers. The beach is less than five minutes drive from Shepherd of the Hills Fish Hatchery and multi-million dollar Dewey Short Visitors Center. It is also less than ten minutes drive from the famed Branson Strip. If you want to avail one of the picnic tables, you are advised to arrive as early as possible. This peaceful sandy beach features great amenities that include kids play ground, pavilion, food vendors, restrooms, and showers. For ultimate water enthusiasts, Moonshine Beach also features a boat launching ramp which is perfect for those who want to enjoy great water sports activities such as fishing, boating, parasailing, jet skiing, waverunners, and more. If you want to get away from the busy city life, come have some fun and spend a relaxing escapade at Moonshine Beach. 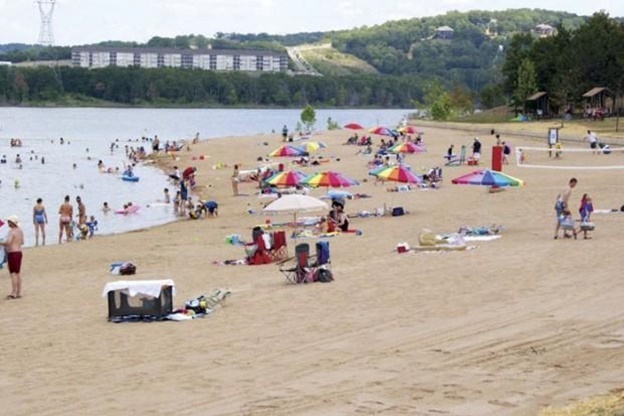 The largest sand beach in southwest Missouri, Moonshine Beach is one of many U.S. Army Corps of Engineers recreational areas on Table Rock Lake. Nestled in a long gentle cove area of Table Rock Lake and very accessible to the Chateau on the Lake Resort, Moonshine Beach adds another element to the myriad of water activities on the 43,000 surface acres of the pristine lake. Whether you come to the beach to play beach volleyball, sunbathing or swimming, Moonshine Beach has everything to let you enjoy a day of fun and excitement. Moonshine Beach is a great place to spend your last beach activity in Branson this first month of autumn season as this recreation area is closing on September 15.